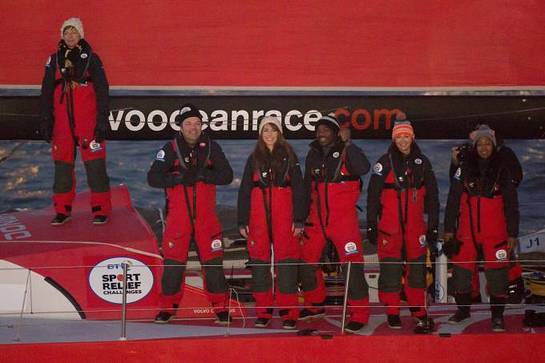 Six exhausted and weather-worn celebrities have crossed the finish line of the BT Sport Relief Challenge: Hell on High Seas. The One Show’s Alex Jones, TV presenter Angellica Bell, comedian Hal Cruttenden, actress Doon Mackichan and TV presenters Ore Oduba and Suzi Perry sailed around the South Coast of the UK, from Belfast to London, in a feat of pure physical, mental and emotional endurance. The challenge, which is sponsored by BT – a long-term supporter of Sport Relief challenges since 2009 – has already raised £944,288. “Thank you so much to everyone for all of your support on our difficult and magnificent journey,” Alex said. During the week, the celebrities were pushed to their limits as they battled gale-force winds of 29 knots, waves of up to 10ft, relentless sea-sickness, lack of sleep and a terrifying moment on day two when the boat nearly capsized. The elements were against them from the outset and with no respite from the brutal conditions, even the most menial tasks, like brushing their teeth, became impossible. On day three the crew were forced to attempt to outpace impending storms by racing the yacht at phenomenal speeds with 30+ knots of wind, steep waves and low tides, in order to make it to shelter safely. The team were living, sleeping and working on the Volvo Ocean 65 – a carbon-fibre speed machine that has been optimized for maximum performance. At 65 feet, and weighing in at 12,500 kgs the vessel is as long as five cars and weighs the equivalent of twelve great white sharks. The money the crew has raised will be used to help transform the lives of some of the most disadvantaged people both at home in the UK and across the world’s poorest communities.